When my three girls were little, we didn't have alot of money for costumes, but I wanted them to experience the fun of Halloween. We did the trick-or-treating thing to relatives, and close friends, and also had a Halloween party for them every year. We had plenty of little cousins to invite! The kids enjoyed helping to make the costumes as much as wearing them! 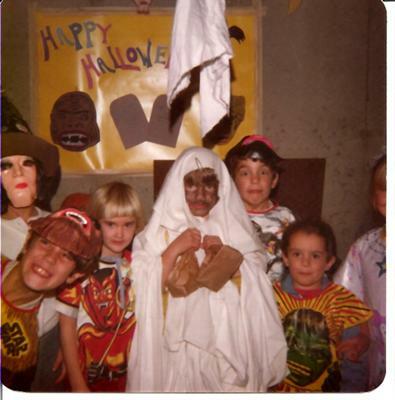 Every year we had ghosts made from old sheets, scarecrows from flannel shirts, old hats, and a bit of hay stuffed in the sleeves and pant legs for effect. Indians, cowboys, space creatures, and always a princess or two. Looking back, I'm sure the kids had just as much fun if not more in their home-made costumes. Jane's Reply - What a great photo of your kids in their homemade halloween costumes. They sure look like they are enjoying themselves. It's amazing what we can invent from simple everyday things from around the house. Just takes a little imagination.